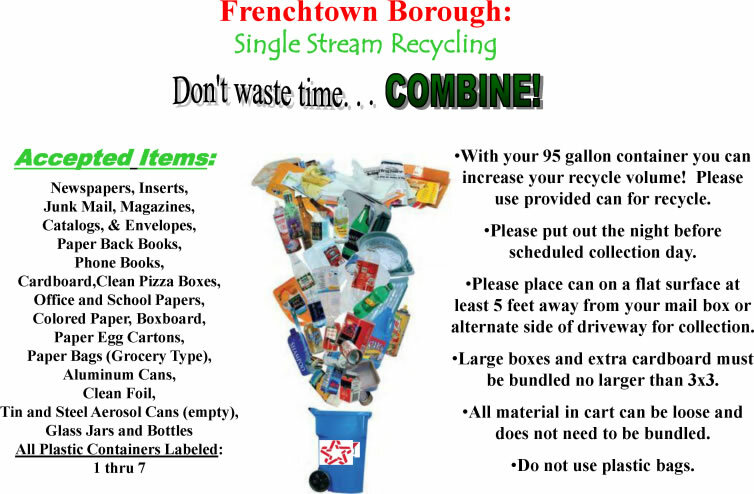 Frenchtown has single stream recycling! What does single stream mean anyway? Single stream recycling refers to a system in which all paper fibers and containers are mixed together in a collection truck, instead of being sorted into separate commodities (newspaper, cardboard, plastics 1 thru 7, glass, metal containers. etc.) by the resident and handled separately throughout the collection process. In single stream, both the collection and processing systems must be designed to handle this fully commingled mixture of recyclables. Please use the blue recycling containers provided by RVD. If the large blue recycling cart is too difficult to maneuver, there are a limited number of smaller carts available. Please contact Borough Hall if you want to change to a smaller cart. Other containers are permitted as needed. Containers should be no larger than the 32 gallon standard garbage cans. 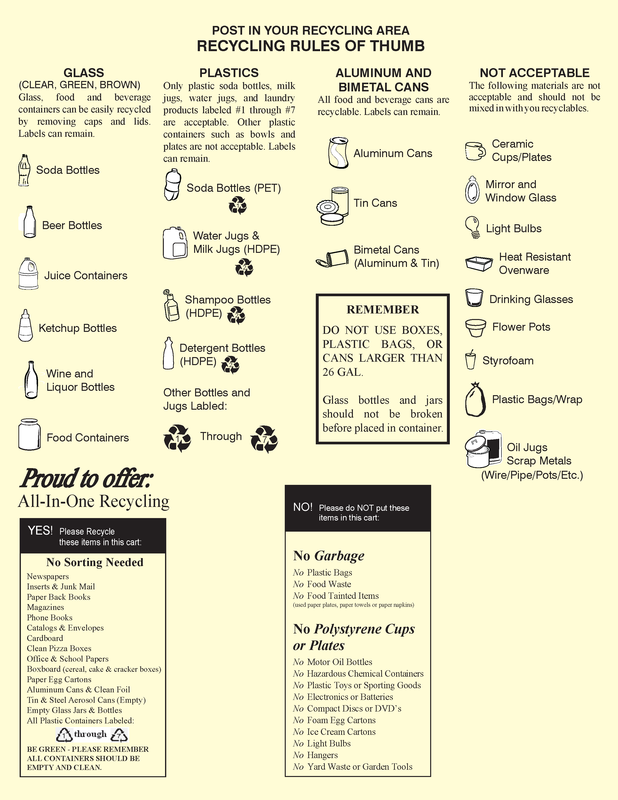 All recyclables can be mixed together in containers. Cardboard that does not fit in the container needs to be flattened and tied. This will reduce the risk of wind blowing the cardboard and to conserve space in the truck. No container should be more that 50 Ibs. in weight. The major concern here is paper which can be very heavy in volume. Brush and leaves may be brought to the Department of Public Works site on Route 29 on weekdays from 8:30 a.m. to 4:30 p.m. (excluding holidays) and the last Saturday of every month from 9:00 a.m. to 12:00 p.m. If a holiday falls on the last Saturday of the month, the DPW site will be open on the first Saturday of the next month to make up for the holiday closure. For more information about all Hunterdon County Recycling Services and Programs, click here.